Performance by Penelope Thwaites, John Lavender from the CD Piano music for four hands. Vol. 1. Music for two pianos. Volume II / Grainger. 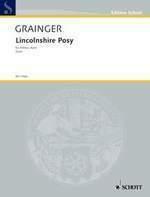 Lincolnshire posy : for military band / Grainger.